1. D Calcium is a metal, and fluorine is a nonmetal. Their electronegativities differ sufficiently for them to create an ionic bond, which is stronger than all other bond types except for network covalent bonding (which NH3 does not exhibit). 2. B Interstitial alloys form when atoms of greatly different sizes combine. The aluminum atoms would have a chance to fit in between the comparatively larger lead atoms. 3. D When drawing the Lewis diagrams for the four choices, the first three are completely non-polar. Only OF2, with a bent shape, would exhibit any dipoles. 4. A Only atoms with at least three energy levels (n = 3 and above) have empty d-orbitals that additional electrons can fit into, thus expanding their octet. 7. B Both gases only have London dispersion forces. The more electrons a gas has, the more polarizable it is and the stronger the intermolecular forces are. 8. A The gas molecules have the same amount of kinetic energy due to their temperature being the same. Via KE = mv2, if KE is the same, then the molecule with less mass must correspondingly have a higher velocity. 9. B First, C2H6 is not an ionic substance and thus has no lattice energy. Next, LiF is composed of ions with charges +1 and −1, and will not be as strong as the two compounds which have ions with charges of +2 and −1. Finally, MgCl2 is smaller than CaBr2, meaning it will have a higher lattice energy, as (according to Coulomb’s law) atomic radius is inversely proportional with bond energy. 11. B A liquid with a low boiling point must be held together by weak intermolecular forces, of which London dispersion forces are the weakest kind. 12. 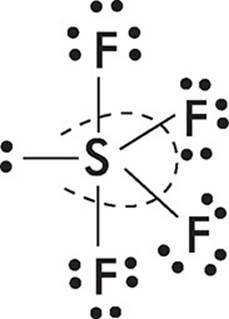 C SF4 has 34 valence electrons distributed in the Lewis dot structure and shape shown below. In this molecule, sulfur forms dsp3 hybrid orbitals, which have a trigonal bipyramid structure. Because SF4 has one unshared electron pair, the molecule takes the “seesaw” or “folded square” shape. Choices (A) and (B), CH4 and , each have 8 valence electrons distributed in the same Lewis dot structure and shape, shown below for . In these molecules, the central atom forms sp3 hybrid orbitals, which have a tetrahedral structure. There are no unshared electron pairs on the central atom, so the molecules are tetrahedral. Choice (D) AlCl4− has 32 valence electrons distributed in the same Lewis dot structure and shape, shown below. 13. C Resonance is used to describe a situation that lies between single and double bonds, so the bond length would also be expected to be in between that of single and double bonds. The best answer here is 140 pm, or choice (C). 14. B The Lewis dot structures for the answer choices are shown below. 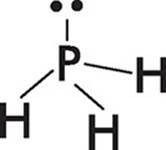 Only PH3 has a single unshared electron pair on its central atom. 15. A H2 experiences only London dispersion forces and has the lowest boiling point. N2 also experiences only London dispersion forces, but it is larger than H2 and has more electrons, so it has stronger interactions with other molecules. 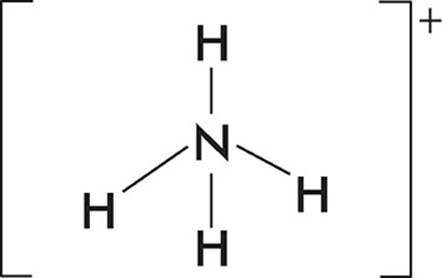 NH3 is polar and undergoes hydrogen bonding, so it has the strongest intermolecular interactions and the highest boiling point. 16. B The bond that holds HCl together is a covalent bond with a large polarity. The bond that holds NO together is also polar covalent, but its polarity is very small because N and O are so close together on the periodic table. 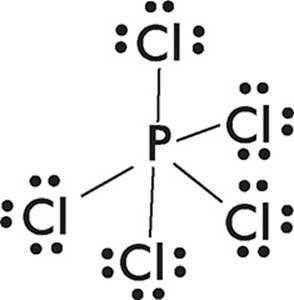 Cl2 is nonpolar because they share electrons equally, and SO3 is nonpolar because it is symmetrical (trigonal planar). Nonpolar molecules have dipole moments of zero. 17. D From Dalton’s law, the partial pressure of a gas depends on the number of moles of the gas that are present. If there are 3 moles of nitrogen, then of the pressure must be due to nitrogen. 18. C From Dalton’s law, the partial pressure of a gas depends on the number of moles of the gas that are present. If the mixture has twice as many moles of helium as neon, then the mixture must be neon. So of the pressure must be due to neon. (1.2 atm) = 0.4 atm. That’s the molecular weight of CO2. 21. D Density is measured in grams per liter. One mole of helium gas has a mass of 4 grams and occupies a volume of 22.4 liters at STP, so the density of helium gas at STP is g/L. 22. D There are initially 3.0 moles of gas in the container. If they react completely, 2.0 moles of gas are produced. 2.0 moles of gas will exert exactly as much pressure as three moles of gas. 24. A We can find the number of moles of gas from PV = nRT. Remember to convert 26°C to 299 K.
25. B First find the number of moles. 26. A Let’s find out how many moles of Na+ we have to add. Because we get 2 moles of Na+ ions for every mole of Na2SO4 we add, we need to add only 0.5 moles of Na2SO4. 27. 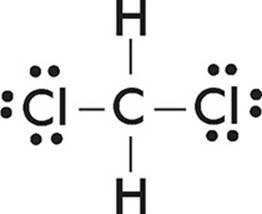 C Hydrogen bonds are the strongest types of intermolecular forces when dealing with molecules of a similar size. Ethylene glycol has twice as many hydrogen bonds as ethanol (acetone has none), and so it would have the highest boiling point. 28. B Vapor pressure arises from molecules breaking free from the intermolecular forces holding them together. 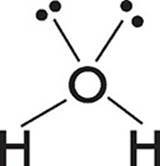 Acetone, which has no hydrogen bonding, thus has the weakest intermolecular forces of the three and thus would have the highest vapor pressure. 29. D Water is very polar, and using the concept of “like dissolves like”, any substance with polar molecules would be soluble in water. As all three molecules are polar, all three liquids would be soluble in water. 1. (a) Atoms of noble gases in the liquid phase are held together by London dispersion forces, which are weak interactions brought about by instantaneous polarities in nonpolar atoms and molecules. Atoms with more electrons are more easily polarized and experience stronger London dispersion forces. Argon has more electrons than neon, so it experiences stronger London dispersion forces and boils at a higher temperature. (b) Sodium and potassium are held together by metallic bonds and positively charged ions in a delocalized sea of electrons. Potassium is larger than sodium, so the electrostatic attractions that hold the atoms together act at a greater distance, reducing the attractive force and resulting in its lower melting point. (c) Both CaO(s) and KF(s) are held together by ionic bonds in crystal lattices. Ionic bonds are held together by an electrostatic force, which can be determined by using Coulomb’s law. CaO is more highly charged, with Ca2+ bonded to O2−. So for CaO, Q1 and Q2 are +2 and −2. KF is not as highly charged, with K+ bonded to F−. So for KF, Q1 and Q2 are +1 and −1. CaO is held together by stronger forces and is more difficult to break apart. (d) KF is composed of K+ and F− ions. In the liquid (molten) state, these ions are free to move and can thus conduct electricity. In the solid state, the K+ and F− ions are fixed in a crystal lattice and their electrons are localized around them, so there is no charge that is free to move and thus no conduction of electricity. (b) The central carbon atom forms three sigma bonds with oxygen atoms and has no free electron pairs, so its hybridization must be sp2. (c) (i) All three bonds will be the same length because when a molecule exhibits resonance, all the bonds are identical to each other, being somewhere in character between single bonds and double bonds. (ii) The C–O bonds in the carbonate ion have resonance forms between single and double bonds, while the C–O bonds in carbon dioxide are both double bonds. The bonds in the carbonate ion will be shorter than single bonds and longer than double bonds, so the carbonate bonds will be longer than the carbon dioxide bonds. 3. (a) (i) The bond strength of N2 is larger than the bond strength of O2 because N2 molecules have triple bonds and O2 molecules have double bonds. Triple bonds are stronger and shorter than double bonds. (ii) The bond length of H2 is smaller than the bond length of Cl2 because hydrogen is a smaller atom than chlorine, allowing the hydrogen nuclei to be closer together. (iii) Liquid oxygen and liquid chlorine are both nonpolar substances that experience only London dispersion forces of attraction. These forces are greater for Cl2 because it has more electrons (which makes it more polarizable), so Cl2 has a higher boiling point than O2. (b) H2 and O2 are both nonpolar molecules that experience only London dispersion forces, which are too weak to form the bonds required for a substance to be liquid at room temperature. H2O is a polar substance whose molecules form hydrogen bonds with each other. Hydrogen bonds are strong enough to form the bonds required in a liquid at room temperature. 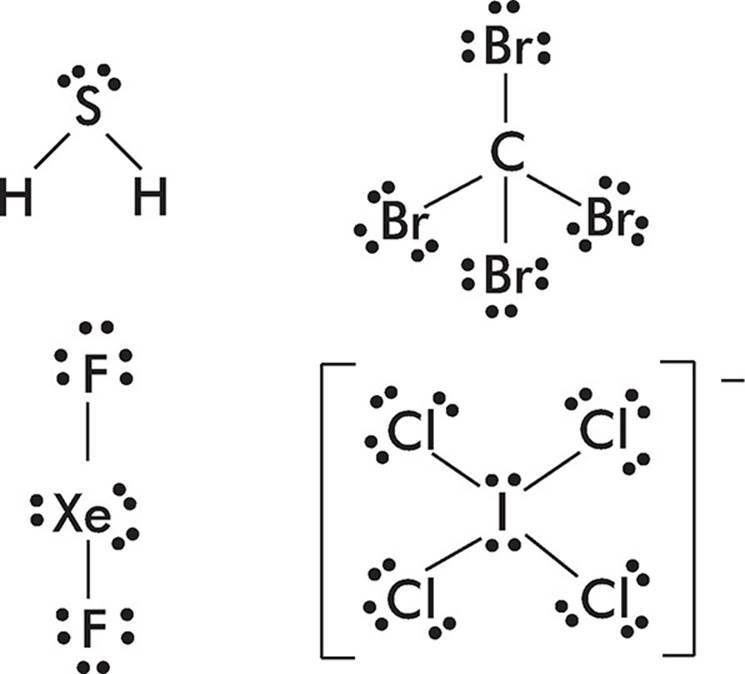 (b) H2S has two bonds and two free electron pairs on the central S atom. The greatest distance between the electron pairs is achieved by tetrahedral arrangement. The electron pairs at two of the four corners will cause the molecule to have a bent shape, like water. CBr4 has four bonds around the central C atom and no free electron pairs. The four bonded pairs will be farthest apart when they are arranged in a tetrahedral shape, so the molecule is tetrahedral. XeF2 has two bonds and three free electron pairs on the central Xe atom. The greatest distance between the electron pairs can be achieved by a trigonal bipyramidal arrangement. The three free electron pairs will occupy the equatorial positions, which are 120 degrees apart, to minimize repulsion. The two F atoms are at the poles, so the molecule is linear. 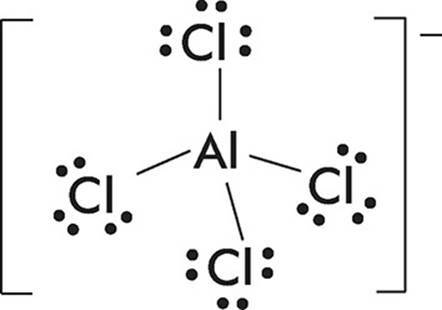 ICl4− has four bonds and two free electron pairs on the central I atom. The greatest distance between the electron pairs can be achieved by an octahedral arrangement. The two free electron pairs will be opposite each other to minimize repulsion. The four Cl atoms are in the equatorial positions, so the molecule is square planar. 5. 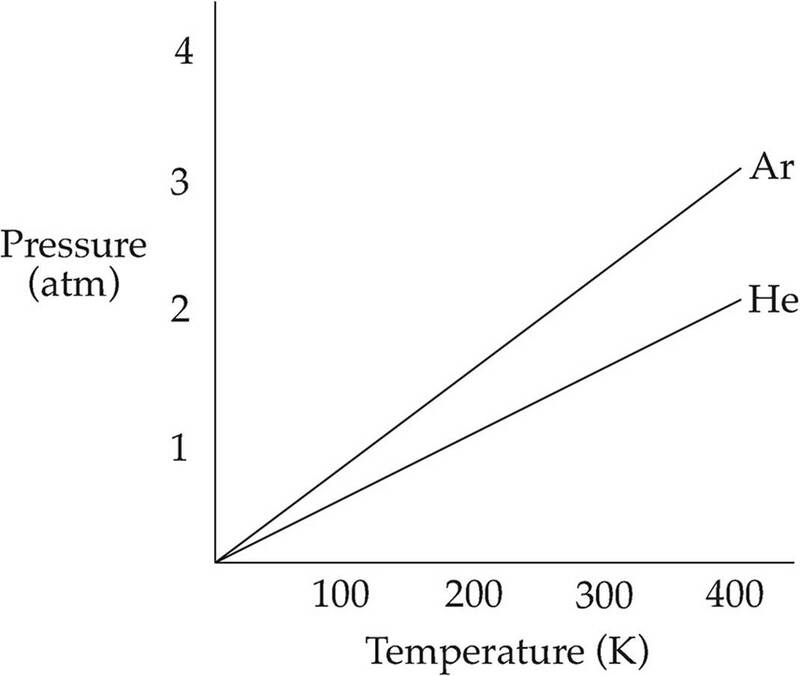 (a) Read the graph, and add the two pressures. (b) Read the pressure (1 atm) at 200 K, and use the ideal gas equation. (c) Use the definition of a mole. (d) As both gases are at the same temperature and thus have the same kinetic energy, the molecules of helium will have a higher average velocity because they have less mass. The higher the average velocity of a gas is, the wider the distribution curve is for the velocities of the individual gas molecules. 6. (a) Use Dalton’s law. (b) Use the ideal gas law. Don’t forget to convert to the proper units. (c) At STP, moles of gas and volume are directly related. (d) We know that 0.056 moles of O2 were produced in the reaction. From the balanced equation, we know that for every 3 moles of O2 produced, 2 moles of KClO3 are consumed. So there are as many moles of KClO3 as O2. 7. (a) The partial pressures depend on the number of moles of gas present. Because the number of moles of the two gases are the same, the partial pressures are the same. (b) O2 has the greater density. Density is mass per unit volume. Both gases have the same number of moles in the same volume, but oxygen has heavier molecules, so it has greater density. (c) Concentration is moles per volume. Both gases have the same number of moles in the same volume, so their concentrations are the same. (d) According to kinetic-molecular theory, the average kinetic energy of a gas depends only on the temperature. Both gases are at the same temperature, so they have the same average kinetic energy. (e) H2O will deviate most from ideal behavior. Ideal behavior for gas molecules assumes that there will be no intermolecular interactions. H2O is polar and O2 is not. H2O undergoes hydrogen bonding while O2 does not. So H2O has stronger intermolecular interactions, which will cause it to deviate more from ideal behavior. (b) To determine the mass of the butane, subtract the mass of the lighter after the butane was released from the mass of the lighter before the butane was released. To determine the moles of butane, use the ideal gas law, making any necessary conversions first. (d) (i) If the lighter is not sufficiently dried, then the mass of the butane calculated will be artificially low. That means the numerator in the molar mass calculation will be too low, which would lead to an experimental molar mass that is too low. This is consistent with the student’s error. (ii) If the temperature of the butane is higher than the water temperature, the calculated moles of butane will be artificially high. This means the denominator in the molar mass calculation will be too high, which would lead to an experimental molar mass that is too low. This is consistent with the student’s error. (iii) If some butane gas escaped without going into the graduated cylinder, the volume of butane gas collected will be artificially low. That will make the calculation for moles of butane too low, which in turns means the denominator of the molar mass calculation will be too low. This would lead to an experimental molar mass that is too high. This is NOT consistent with the student’s error.